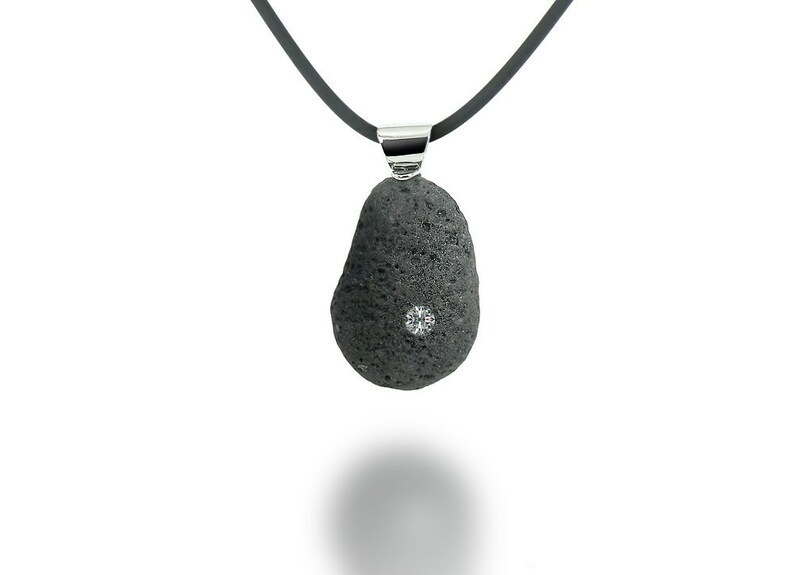 Adorn yourself with this Unique and elegant One-Of-A-Kind gray Raw Lava Rock oblong pendant, set in Stainless Steel with a 4mm White Sapphire set inside the rock. This Lava Rock comes from the black beach of Vulcano Island (Southern Italy), the shape is purposely untouched by us, we left it the same as we fund, just shaped by the ocean waives, carefully selected in color and tone, with amazing color range from dark to light gray. 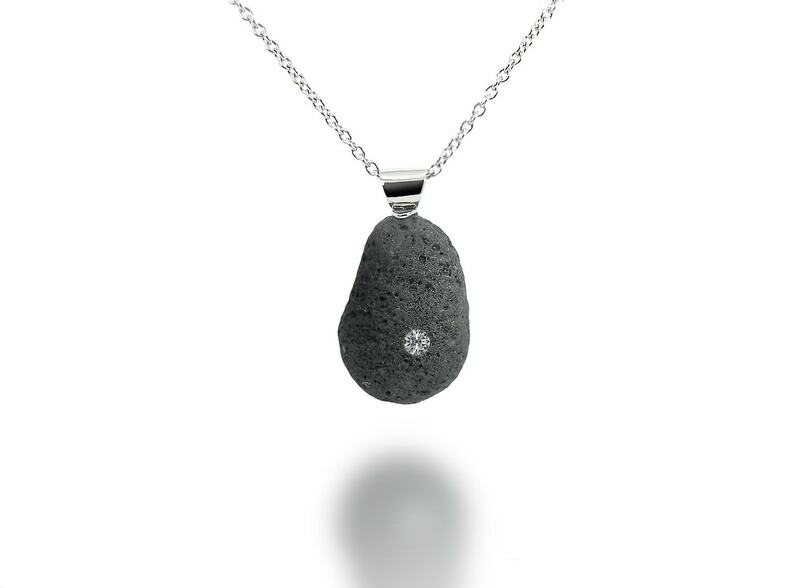 This pendant comes with a elegant jewelry box ready to give as a gift. NOTE: this pendant is "made to order", we will try to make it as close as possible to the image show, however, the dimensions and overall look are approximate, and the final piece can have a slightly different look. 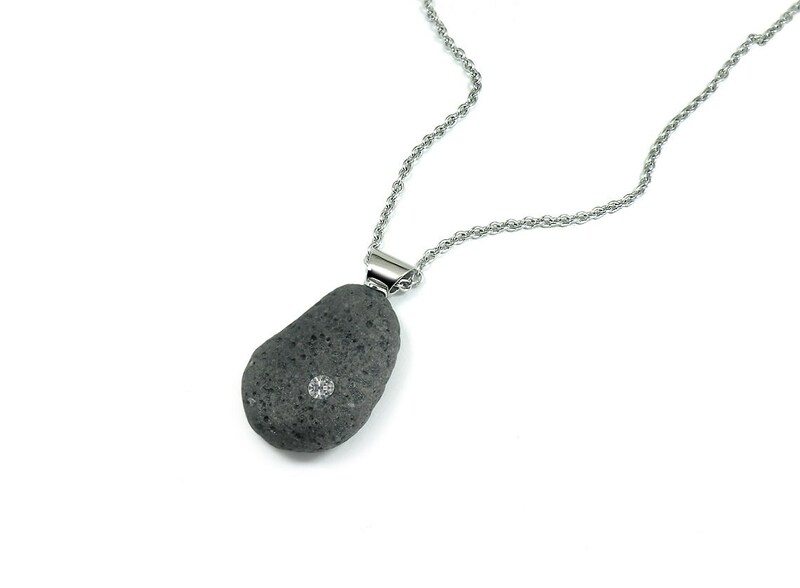 this pendant comes with 2mm Stainless Steel chain with lobster clasp. or 2mm Cord necklace (view the image above) Length available from: 14" to 26". When the volcano erupts, gas and rocks come out of the opening. The rock is very hot, so it is melted (magma). Crystals and minerals are in the rock, but the crystals dissolve because it is so hot. When the magma gets to the surface, it is called Lava. When the lava hardens, it is called Lava Rock. 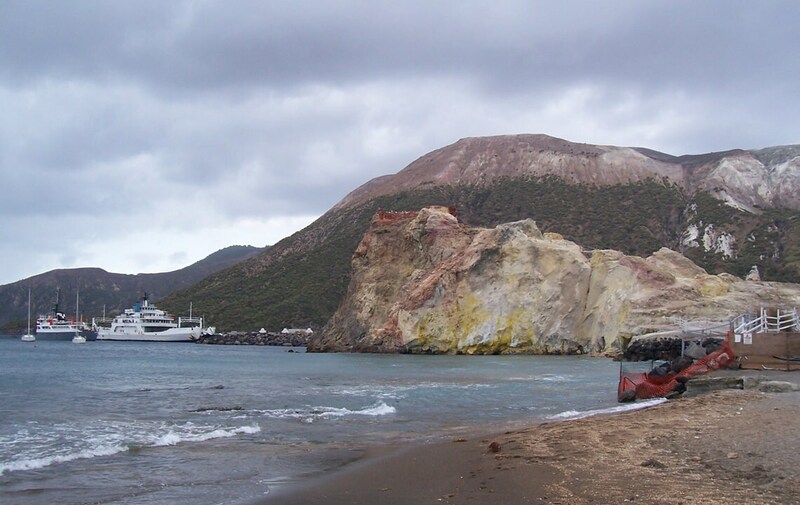 Vulcano is an island of 21sqm belonging to the Aeolian Archipelago. According to Greek mythology, here was placed the forge of Hephaestus, the god of fire, who worked as a blacksmith with the assistance of the Cyclops. But the island was named after the Roman name of the God, that is Vulcan, hence the term vulcanology. Vincenzo Taorminain spends most of his summer vacation in Vulcano Island. There he recharge himself from the invisible energy coming from the slightly active Vulcano.. while he sketches on paper new ideas for upcoming Collections. 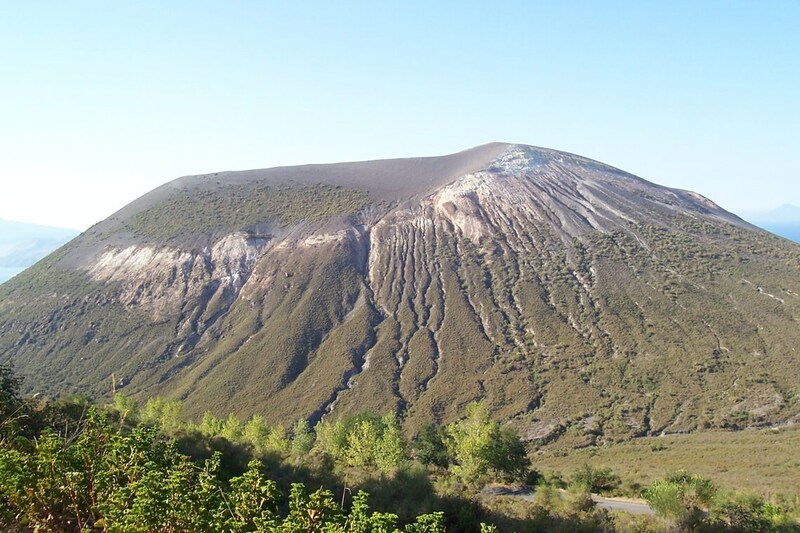 The very existence of the island results from the fusion of four volcanoes; the largest and most dominant peak, Vulcano della Fossa, rising up to 391m of reddish rock. Beside is the smaller Vulcanello, 123m, which erupted on the north side in 183 BC. Although the last eruption dates back to 1890, the volcano has never ceased to betray signs of its activity; even today, such phenomenons as fumaroles, jets and steam above and below sea level and sulphurous mud, highly prized for its therapeutic properties, continue to be very much in evidence. Wonderful. Thank you very much.